Our range of services include 1326 HID ProxCard II Clamshell Card, HID Proximity 1326 ProxCard II Clamshell Card, Electromagnetic Locks ( Em Locks ) 600 LBS With LED, 213x iCLASS Embeddable iCLASS Prox Embedded Card, HID	Proximity Reader and HID Proximity Reader Card. 1326 HID ProxCard II® Clamshell Card -All India Free Shipping with no minimum quantity . we have also attached the type of HId readers in images it will work with for your reference . TheProxCard II proximity access card is the industry choice for a cost-effective solution to proximity access control, with universal compatibility with all HID proximity readers. The ProxCard II provides durable packaging and consistent read range. The iCLASS® smart card and iCLASS Prox Embeddable Cards include iCLASS 13.56 MHz contactless read/write smart card technology with the ability to add the contact smart card module of your choice. Your iCLASS Embeddable smart card can be utilized for such diverse applications as access control, network log-on security, cashless vending, time and attendance and biometric verification. You can now take full advantage of iCLASS access control capabilities with the myriad of contact and contactless smart card software applications. The iCLASS Embeddable Smart Card meets strict ISO thickness standards for use with direct image and thermal transfer printers. iCLASS and iCLASS Prox Embeddable proximity smart cards are available in standard PVC card construction, or composite Polyester/PVC construction for more demanding environments. The proximity smart cards can be produced with visual security and anti-counterfeiting features such as holograms, ultra-violet fluorescent printing, micro-printing and custom logos to quickly and easily identify genuine cards. Designed to be embedded with an optional contact smart chip module of your choice. Enables contact smart chip applications to be added to iCLASS or iCLASS Prox cards in a single ISO standard thickness card. Available in standard PVC card construction, or Composite Polyester/PVC construction for more demanding environments. Offers the ability to add a magnetic stripe, barcode, anti-counterfeiting feature, custom artwork, or photo ID. Physical CharacteristicsColorBlackDepth0.7"Form FactorWall MountableHeight3.1"MaterialPolycarbonateWeight (Approximate)2.70 ozWidth1.7"
We have gained appreciation by providing our clients with a wide assortment of HID-6100BKN0000 that is used in several offices, homes, commercial complexes and corporates. Our range is stringently checked and tested by our team of quality controllers to ensure flawlessness. Apart from this, we also use quality packaging material for packing our range of products to ensure safe and damage free packaging. iClass Card: Up to 3.25"
iClass Key/Tag: Up to 2.0"
Card Serial Numbers (CSN): Up to 2.0"
CLASS readers offer an open architecture design permitting compatibility with many of the most popular cards in the market, which comply with ISO 14443A, 14443B, and 15693 interoperability standards. Regional compatibilities include US Government PIVII (FIPS201),offering one of the most flexibility reader platforms available. iCLASS readers are user-friendly, delivering the same convenience and reliability of our Prox technology, for which HID is known worldwide, with state-of-the-art features, driven by evolving industry requirements. Upgrading from Prox to iCLASS technology has never been so simple. All iCLASS readers provide the same wiring connections, low-current consumption, and 5- or 12-volt operation as our Prox readers. Additionally, you can transfer your Prox format and user identification numbers to iCLASS credentials, making the change completely transparent to your access controller. Wiegand, Clock-and-Data, RS-232, RS-422, and RS-485 output modes are configurable. "Parking hold" feature ensures accurate detection of vehicles in parking lanes. Power requirements: 12 or 24 VDC (configurable) . Current requirements: 200mA avg / 700 mA peak at 12VDC; 260mA avg / 1.2A peak at 24 VDC. Dimensions: 12.0" x 12.0" x 1.0" (30.5 x 30.5 x 2.54 cm). 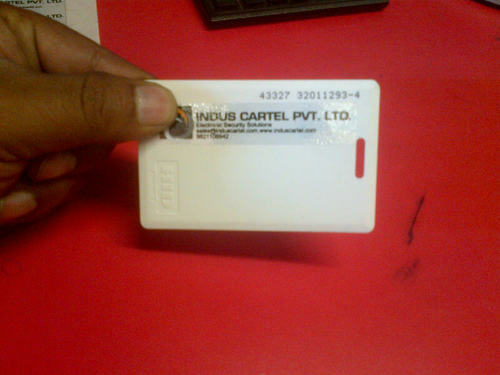 Our clients can avail from us, a wide range of 2080 iClass Clamshell Cards that gives 13.56 MHz read/write contact less smart card technology in a cost effective card package. This is available with an ABS shell construction, which provides durability in harsh environments. It gives increased security via encryption and mutual authentication by providing convenience, affordability and reliability of proximity technology. Packaging Details: As per Company Packing. 100% Advance Payment.